"I'm a fifth-generation farmer..." those are the words uttered by many a farmer in my neck of the woods...but what does that really mean? In this generation, very few of us live in the same state as our parents and grandparents, let alone in the same house, doing the same job, and owning the same property. But farmers and ranchers still do! As a fifth generation farmer myself, that means that the land that we live on has been owned by my husband's ancestors (great-great grandparent, great grandparent, grandparent, parent or ourselves) and in farming for more than 125 years. When we first got married nearly 25 years ago, we renovated a little 600 square foot house that my soon-to-be husband's grandparents first built and lived in. His parents lived there when they were first married and we began our life together in that little home. But home ownership is just the tip of the iceberg. How many kids want to have the same job that their parents have? We are blessed with five kids--ages ranging from 22 to 18 (yes, there is a set of twins in there)--and they have all worked hard on the farm right beside my husband and me from the day they were born. As we plan the fence we will build during Spring Break from school, my husband talks about the fence as "their" fence; we are building for them as the land will one day pass to them and they will benefit from having good, strong, long-lasting fences built correctly, on their land. Building fence is a perfect family activity! My husband is actually a really good fence-builder. There is a certain amount of skill and artistry to building a good 5-wire barbed wire fence. The choice of materials, quality of materials and way they are put together all constitute a long-lasting fence...or you might be building a fence that will work well for a year or two, but will need extra work and replacements to keep it functional. Kids, even when they are young, learn to carry tools, dig holes and watch Dad pull the wire taut to create a fence that doesn't sag. Nowadays, our kids are all old enough to actually do the fence-building themselves. Their dad and I are just support staff! Why do I tell you this about building fence? It is actually a perfect example of the generational nature of farming and ranching. So much of what we do as farmers and ranchers is for the good of the land. We are environmentalists at our core! The very basis of our jobs depends on the land and it being in good shape to be passed on to the next generation. That is dependent on not only the land, but also the kids' desire to own and care for the land themselves. 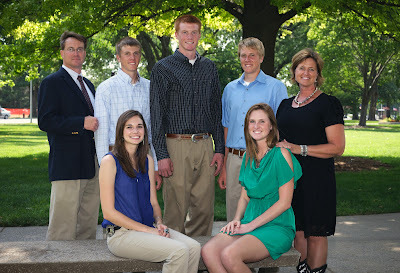 Something I've heard more of lately is that 96% of all farms in America are family owned and operated. That actually is amazing to me--but not in the way that you may think! I can't believe that 4% are not family owned! I truly do not have any knowledge of farms in my area owned by others than a family! The family may be a multi-generational group that has incorporated so that ownership can be passed down, or even a set of siblings who own contiguous land, and manage it together, but own it separately. Each family owns thousands of acres these days because that is what it takes to make a living. It used to be a family could make a decent living off 80-acres, or more recently 640 acres. But today, it takes more land and more product to raise a family. So I often shake my head when someone talks about a "factory farm" as if it is a real thing and that they are everywhere. Family farms are the vast majority and we are proud of our ability to adapt to higher expectations and include new technology to make our farms and ranches better than ever before! We work side by side with our kids to instill in them the love of the land, the responsibility we have to care for the livestock, and appreciate the lifestyle of never "going to work" but working every day in a job that we love and value. I'm proud to be a family farmer and I'm teaching my kids to value that title as well. 1. We've been eating meat for 1.5 million years. 3. We were born to eat meat. 5. Farms are lowering their carbon footprint. 7. Farm animals are not the same as pets. 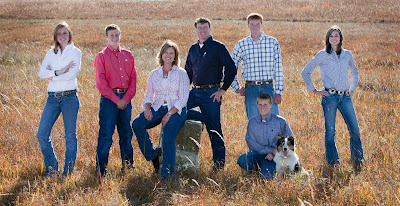 I so enjoyed this post about fences, family farms and the commitment of this family to the land and also to the beef they raise for us to eat! Also proud I met this wonderful rancher several years ago at a function and she and her family are truly role models !! ! You are very kind!! Thanks for your support and keep up the great work! Great post Debbie! The same goes for my area. I can't think of any farm that isn't family owned! I totally agree....and one of the most important values is hard work! That is an important skill for any job! Such a great story - building fences together is like building a farm together! thanks, Katie. And thanks for giving me the chance to blog for your party! Great topic and I've seen lots of engagement about it!